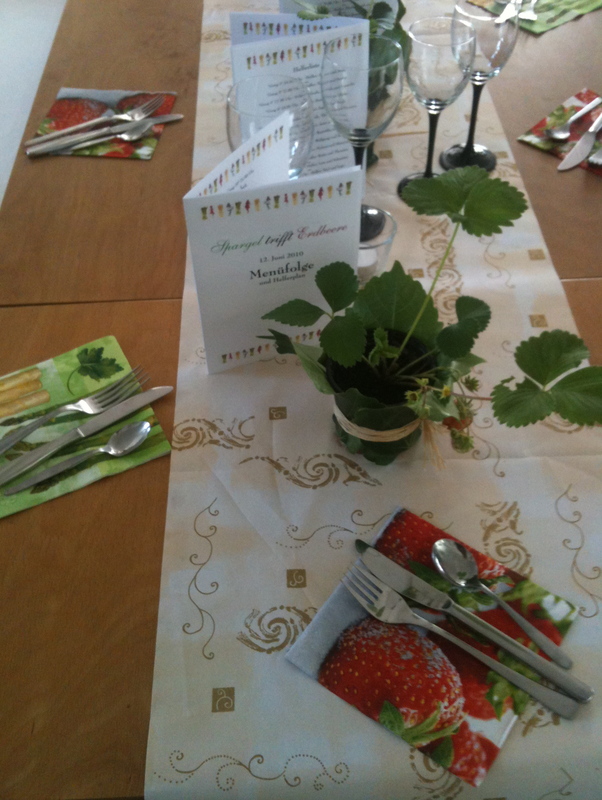 Last Saturday we were invited by some of our friends to a spring cooking event called “Spargel trifft Erdbeere” (see title of this post for the translation!!). The concept is quite simple: you register for the event, stating whether you will be attending as a passive guest or an active one cooking, but it seemed to me that everybody was an active guest in one way or another, including Second Daughter who decided, after hogging the piano first, that getting hold of a microphone and telling stories in German was the thing to do… Shy she is not! Anyway, 26 “cooks” were participating – for the most part in teams of two – which meant that we ended up with… 15 courses! When I read the menu I wondered how on earth I was going to manage, but given that we started at 16:30 and finished at 00:30, and that the portions were very small, I felt surprisingly “light” when we left! All the courses were delicious and we ate delicacies such as “Warm Asparagus and Strawberry Salad”, “Catfish with Truffles in an Asparagus Mantel”, “Prosecco Risotto with Shellfish and Green Asparagus” or “Chicken Breast Meets an Asparagus and Carrot Mousse on a Curry and Strawberry Mirror”. Interestingly there was also a dish called… “Meat”, and that poor team got a bit teased about it, but the end result was very nice too, in my case minus the meat but I was told it was excellent. As for us, we cooked “Fresh Tagliatelle with a Green Asparagus and Chanterelle sauce” and as we were complimented I can say it was a success! It was supposed to be prepared with morels but as we miserably failed to secure them we had to improvise. It was a truly enchanting evening with interesting and fun people, and I would like to thank our hosts once again. Should there be another cooking event in the future, we will be there without fail!